This is the true story of seven strangers, picked to work for a newspaper company and have their lives blogged, to find out what happens when people stop lollygagging around and start doing WORK. The Office - ORLANDO! 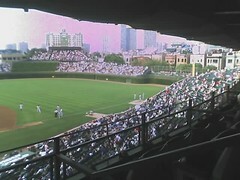 Btw here's our view from the sky box during the Cubs vs Sf Giants game. Debbie Gibson sang star spngled banner in pink boots. I don't know why I had to include that little tidbit but it looked out of place in the field of green grass. I would have loved to go to the Cubs game. When I was a kid my brothers and I used to take the L to the game and buy $1.50 grandstand seats... basically right where you took that shot from. Moreover, my adult-era favorite team is the Giants, of course, since I lived there for over a decade and my wife and kids are SF natives. Correction: the Cubs actually won the game on Monday night in the bottom of the ninth. By that time many of the producers had moved on to John Barleycorn's to tip back a few cold ones then head back downtown. Oops sorry FJ. Must've listened to the news the next day and got confused. Barleycorns? I grew up 2 blocks from there on Belden and Halsted! I'm getting homesick! Goodbye to our Feeds crew! This is a Flickr badge showing public photos from jarpon. Make your own badge here.